It is no easy job securing an ever-changing roster of 300 employees, working for 20 different companies, all under one roof. But Aperio® wireless locks from ASSA ABLOY are built for situations like this. Online functionality enables facilities managers at Technology Park Písek to conduct instant security audits, and to issue or revoke access rights at the click of a mouse. As part of a large investment at this site, we demanded an access control system that worked online and around the clock. Aperio® met our needs perfectly, says Petr Fort, at Technology Park Písek. System integrator ABBAS installed 140 Aperio® escutcheons at the Technology Park, as part of its Dominus Millennium access control system. Each is linked wirelessly to the electronic access control system. 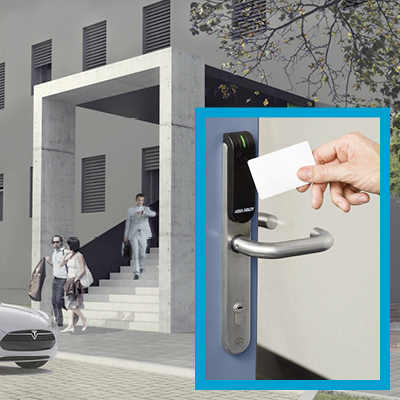 Access at the door is provided by RFID technology, in this case iCLASS from HID Global. About Aperio®: Available on the global market place, ASSA ABLOYs Aperio® Technology enables a wide range of access control providers to cost-effectively integrate non-wired doors with mechanical locks into access control systems. About Technology Park Písek: Opened in autumn 2013, Technology Park Písek is a science and technology office complex built inside historic renovated barracks in South Bohemia, Czech Republic. Measuring around 7,600 square metres, it is designed to house between 18 and 20 innovative companies in the ICT sector.